I'm enjoying tinkering with Cocoa on my Leopard Mac and I thought it might be fun to take a peek at Objective C and the framework on Linux in particular for developing command line tools. My thinking is that it would be nice to develop the code under XCode and then just compile for Linux if I can figure out where the frameworks diverge and keep to compatible code. 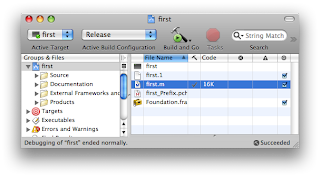 The same code can be built in Xcode and will run on the mac. The GNUstep framework is very well documented here. One immediate incompatibility I ran into was the starter code for a Foundation command line tool ended with [pool drain] instead of [pool release] - a little DTS humour no doubt!